5 Pack of Extra Small O-Rings for use on Prop Savers. Approximately 7/16" (11.5 mm) OD. 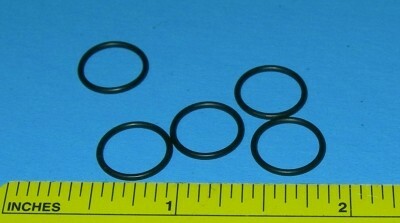 5 Pack of small replacement O-Rings for use on Prop Savers. Approximately 1/8" smaller in diameter. 5 Pack of Replacement O-Rings for use on Prop Savers. 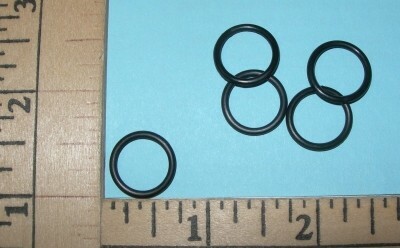 5 Pack of heavy duty O-Rings for use on Prop Savers. 3/32" (.094") thickness. Propeller Saver. PropSaver for 1.5mm shaft. Photo shows typical shaft saver mounted to generic prop. Prop is not included. Weight .83 grams plus O-ring. Weight .93g with included O-ring. Fits 2mm motor/gearbox shaft, locking on with screws. O-Rings to bind prop to saver hub is included. It is reccomended that the shaft be extended through the saver cone about .1 to .125" (3mm). GWS Prop Saver Adapter. Four different applications-any GWS motor or geared drive shafts. Will fit shafts from 2mm to 4.0mm. One of each size. Hub held to threaded shafts with nuts, prop held to hub with rubber bands which allow prop to fly off upon contact with ground. Easy to reinstall often undamaged prop with rubber bands. Special notes from Dave: You will probably put install these right at the base of the threads then cut the shaft. Although not a requirment,you'll probably want to shorten shaft with Dremel cut off wheel (USE SAFETY GLASSES!!!) so a short stub reaches into but not through prop for centerting yet allowing the prop to flip off at impact. Hubs have molded centerting boss presumably to match up nicely to most GWS brand props. Use your own judgement and set up to suit your use. Photo shows typical shaft saver mounted to generic prop. Prop is not included. Propeller Saver for 3.0mm shaft. Photo shows typical shaft saver mounted to generic prop. Prop is not included. Himax Prop Saver Adaptor 3.0mm Shaft. Prop held to hub with rubber bands which allow prop to fly off upon contact with ground. Easy to reinstall undamaged prop with rubber bands. Himax Prop Saver Adaptor 3.2mm-1/8" Shaft. Prop is held to hub with rubber bands which allow prop to eject upon contact with ground. Easy to reinstall undamaged prop with rubber bands. PropSaver for 4.0mm shaft. Photo shows typical shaft saver mounted to generic prop. Prop is not included. Fits 4mm motor/gearbox shaft, locking on with screws. O-Rings to bind prop to saver hub is included. It is reccomended that the shaft be extended through the saver cone about .1 to .125" (3mm). This unit has a blind hole for the motor shaft. 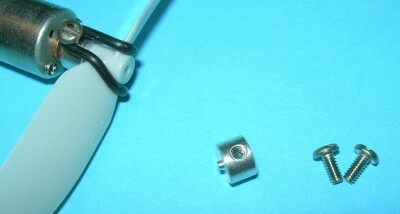 The front of the adapter becomes the front of the shaft. A 1.4mm nub centers your prop. Made for props designed to press onto 1.5mm shafts. 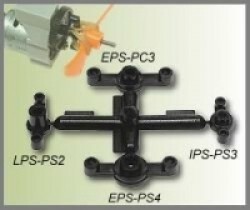 Perfect to get your GWS 3-2 or 3-3 prop mounted with a saver on your brushless motor. We suggest our small o-rings above for use with this saver. The included rubber bands are of poor quality and should be discarded.